Sarah Wentworth Apthorp Morton (August 1759 – May 14, 1846) was an American poet. The Apthorp mansion, where Sarah grew up, is the second on the right. Sarah was born in Boston, Massachusetts in August 1759. She was the third of ten children born to James Apthorp (1731–1799), a merchant and slave-trader, and Sarah Wentworth (1735–1820), whose family owned Wentworth Manor in Yorkshire. Her father was one of eighteen children born to her paternal grandparents, Charles Apthorp (1698–1758), the prominent British-born merchant in 18th-century Boston, and Grizzelle (née Eastwicke) Apthorp (1709–1796). Her maternal grandfather was Samuel Wentworth (1708–1766), also a Boston merchant, and his father was John Wentworth (1671–1730), the colonial Lieutenant Governor of New Hampshire who lived in Portsmouth, New Hampshire. In 1792, she wrote an anti-slavery poem entitled The African Chief, which was, in fact, an elegy on a slain African at St. Domingo in 1791. In 1796, Sarah and her husband Perez moved to Dorchester. From an early age, Sarah had begun writing poetry, but until 1788 her works had only circulated among her friends. She began publishing under the pen name Philenia, and her first book was printed in 1790. Her work was widely acclaimed, with Robert Treat Paine, Jr., in the Massachusetts Magazine dubbing her the "American Sappho". At one time she was thought to be the author of The Power of Sympathy (1789), widely considered to be the first American novel, but that has since been attributed to her uncle, William Hill Brown. Sarah Apthorp Morton (1782–1844), who married Richard Cunningham, son of John Cunningham, in Nova Scotia. Anna Louisa Morton (1783–1843), who did not marry. Frances Wentworth Morton (1785–1831), who did not marry. Charles Ward Apthorp Morton (1786–1809), who did not marry. Charlotte Morton (1787–1819), who married Andrew Dexter, Jr. (1779–1837), a lawyer, financier, and speculator. Sarah died on May 14, 1846 in Braintree, Massachusetts. She was buried at King's Chapel Burying Ground in Boston. In the mid 1780s, Sarah's younger sister Frances Apthorp (1766–1788), or Fanny as she was known, came to live with her and her family. Reportedly, Fanny was seduced by, or fell in love with, Sarah's husband Perez. Fanny gave birth to his child in 1787 or 1788, after which their father "demanded a confrontation with Perez, which Fanny begged him not to do. She argued it would cause a scandal and disgrace the family." Once the affair became public, Fanny took an overdose of laudanum and committed suicide due to the family backlash. Fanny left a suicide note proclaiming her "guilty innocence" that was published in the local newspapers shortly after her death. In January 1789, as the scandal settling down, Sarah's brother Charles Apthorp challenged Morton to a duel. When the two men met to duel, the sheriff was there and prevented the illegal encounter. With the affair and her sister's suicide, the Morton's marriage had deteriorated, however, the couple later reconciled. In spite of this reconciliation, fifteen years later Sarah would have an affair with founding father Gouverneur Morris . Her Dorchester home is a site on the Boston Women's Heritage Trail. Through her daughter Charlotte, she is the great-great grandmother of Frederick Bradlee (1892–1970), an American football player who was a first-team All-American while attending Harvard University in 1914. Frederick was the father of American journalist Ben Bradlee (1921–2014) and the grandfather of journalist Ben Bradlee Jr. (b. 1948) and filmmaker Quinn Bradlee (b. 1982). Beacon Hill. A Local Poem, 1797. The Virtues of Society. A Tale Founded on Fact, 1799. My Mind and Its Thoughts, in Sketches, Fragments, and Essays, 1823. ^ "Sarah Wentworth Apthorp Morton | American poet". britannica.com. Encyclopedia Britannica. Retrieved 26 January 2018. ^ Hurd, Duane Hamilton (1884). History of Norfolk County, Massachusetts: With Biographical Sketches of Many of Its Pioneers and Prominent Men. J. W. Lewis & Company. p. 336. Retrieved 26 January 2018. ^ "Sarah Wentworth Morton". womenhistoryblog.com. History of American Women. 31 August 2012. Retrieved 26 January 2018. ^ a b c "Gilbert Stuart Sarah Wentworth Apthorp Morton (Mrs. Perez Morton), 1802–20". www.worcesterart.org. Worcester Art Museum. Retrieved 26 January 2018. ^ a b c d "The 1788 Scandal of Fanny Apthorp Never Dies - New England Historical Society". 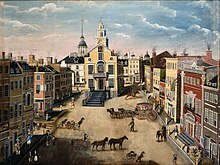 newenglandhistoricalsociety.com. New England Historical Society. 21 January 2015. Retrieved 26 January 2018. ^ Morgenroth, Lynda (2007). Boston Firsts: 40 Feats of Innovation and Invention That Happened First in Boston and Helped Make America Great. Beacon Press. p. 50. ISBN 9780807071328. Retrieved 26 January 2018. ^ a b c d Davidson, Cathy N. (1987). Revolution and the Word : The Rise of the Novel in America: The Rise of the Novel in America. USA: Oxford University Press. p. 289. ISBN 9780199728855. Retrieved 26 January 2018. ^ Oliver, Andrew and James Bishop Peabody, eds. The Records of Trinity Church, Boston, 1728–1830. Publications of the Colonial Society of Massachusetts. Collections 56 (1982). ^ a b c d Kamensky, Jane (2008). The Exchange Artist: A Tale of High-flying Speculation and America's First Banking Collapse. Penguin. p. 374. ISBN 9780670018413. Retrieved 26 January 2018. ^ Dorchester Antiquarian and Historical Society (Dorchester, Boston Mass.) (1859). History of the Town of Dorchester, Massachusetts. E. Clapp, jr. p. 569. Retrieved 26 January 2018. ^ Crawford, Mary Caroline (1930). Famous Families of Massachusetts, Vol. 2. Little, Brown, and company. pp. 146–147. Retrieved 26 January 2018. ^ Brown, Aaron (2011). Red-Blooded Risk: The Secret History of Wall Street. John Wiley & Sons. p. 114. ISBN 9781118140178. Retrieved 26 January 2018. ^ Brookhiser, Richard (Spring 2002). "The Forgotten Founding Father". City Journal. Retrieved December 4, 2018. ^ "Dorchester". Boston Women's Heritage Trail. ^ Walter Muir Whitehill (1970). "Frederick Josiah Bradlee". Massachusetts Historical Society: 116–127. JSTOR 25080695. ^ Ben Bradlee (1995). A Good Life: Newspapering and Other Adventures. Simon & Schuster. pp. 20–22. ISBN 0-684-80894-3. ^ Danvers Historical Society (1922). Historical collections of the Danvers Historical Society. Danvers Historical Society. p. 42. Wikimedia Commons has media related to Sarah Wentworth Apthorp Morton. Sarah Wentworth Morton (1759-1846), The Heath Anthology of American Literature, Houghton Mifflin. Sarah Wentworth Apthorp Morton, 1759-1846, Dorchester Atheneum. Gilbert Stuart: Sarah Wentworth Apthorp Morton (Mrs. Perez Morton), 1802–20, Worchester Art. This page was last edited on 4 December 2018, at 19:51 (UTC).